Get some cultural insight at Seurasaari Island and Open-Air Museum and Design Museum. Step out of the city life by going to Bellevue Beach and Aurinkolahti Beach. 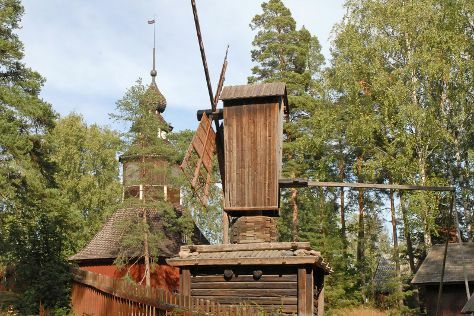 Get out of town with these interesting Helsinki side-trips: Fagervik Museum (in Inkoo) and Stromforsin ruukki (in Ruotsinpyhtaa). There's lots more to do: explore the world behind art at Kansallisgalleria, soothe aching muscles at some of the top local wellness centers, and test your problem-solving skills at popular escape rooms. London, UK to Helsinki is an approximately 6-hour flight. You can also do a combination of flight and ferry; or do a combination of car and train. Traveling from London to Helsinki, you'll lose 2 hours due to the time zone difference. In February, Helsinki is little chillier than London - with highs of 0°C and lows of -3°C. Wrap up your sightseeing on the 21st (Thu) to allow time to travel to Rovaniemi. Get in touch with nature at Safaris and Ounasvaaran Hiihtokeskus Oy. Step off the beaten path and head to SantaPark and Rovaniemi Church. There's still lots to do: explore the fascinating underground world of Syvasenvaara Fell, get lost in a book at Rovaniemi City Library, stop by Your Piece Of Finland, and have fun at Santa Claus Office. To find traveler tips, reviews, ratings, and other tourist information, read our Rovaniemi tour itinerary planning site . Traveling by flight from Helsinki to Rovaniemi takes 4 hours. Alternatively, you can do a combination of flight and train; or drive. Traveling from Helsinki in February, things will get a bit cooler in Rovaniemi: highs are around -6°C and lows about -11°C. Cap off your sightseeing on the 24th (Sun) early enough to travel back home.